Water + Gun = Water gun. Water gun is an understandable object. Ink and gun, therefore, is a variation under that kind of understandable relationship. 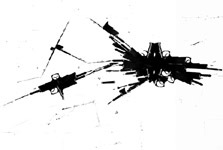 I playfully mix and combine images of a gun and the flowing of ink, merging into one medium.... a friction contrary to the common comprehension of ordinary people and some sort of black humor. This kind of black humor is not about anti-heroism, but the sneer of the odd marriage between contradictions and the give-and-take situation of anything.